The Flemish Giant Rabbit can be quite large, even when it's not stretched out in a leisurely pose! If you're looking for a gentle giant, you can't go wrong with the Flemish Giant Rabbit. Their large size might seem intimidating, but they are quite calm and sweet natured. This rabbit makes a great pet. Its personality has been compared to that of the most gentle of dog breeds. Flemish Giants usually get along very well with other pets too. Background: The origins of Flemish Giants is somewhat uncertain, but the breed was refined in Europe. The large rabbits of Flanders may have been bred with giant Patagonia Rabbits from the Argentine Republic. This breed was often used for food, but eventually became popular as a pet as well. They were brought to the United States in the early 1900's. Description: Flemish Giant adults weigh over 13 pounds, and sometimes as much as 22 pounds. They have long, well built bodies and rounded rumps. Their ears are long and erect, and their heads broad. Color differences: Flemish Giant Rabbits come in a variety of colors including black, blue, fawn, light gray, sandy, steel gray, and white. Patchy coats are not as desirable as those with more even colors. 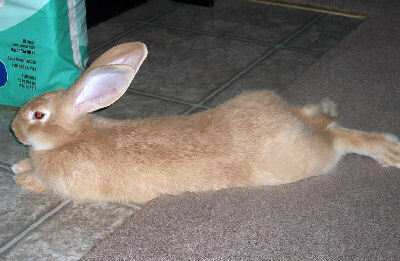 Availability Prices for Flemish Giant Rabbits run about $50 for pet quality, and up to $150 for show quality. They are easy to find online, and it's likely that you will be able to find a breeder in your local area. I need a buck and two doe, young adult breeding family of pure breed giant Flemish rabbit.